The Duke and Duchess of Cambridge left Kensington Palace with Prince George and four-day-old Princess Charlotte today. It is understood the couple are headed for their country retreat Anmer Hall, where they are expected to spend the summer, with Kate focusing on motherhood and William concentrating on his role as an air ambulance pilot. The family will be joined at Anmer by Nanny Maria Teresa Borrallo, and the Middletons are said to be planning a stay, too. The Cambridges were expected to leave their London home sooner but decided to wait a few days to give Her Majesty a chance to meet Charlotte, while grandfather, Charles, visited twice. Below we see the Cambridges leaving Kensington Palace shortly after Prince George was born. The family headed to Bucklebury for several weeks at the time. There is a very brief video at the Telegraph. The Duchess looked relaxed in a white/cream coat. Ashley believes it is the JoJo Maman Bebe piece she wore for her visit to the set of Downton Abbey. The appropriately named 'Princess' wool coat is described as "a great investment piece for your maternity wardrobe". The wool-mix fabric gives it a luxurious, cosy feel. The collarless garment features front slant slip pockets, tonal top-stitching and panel seaming. Kate accessorised with the very pretty Beulah London 'Brisa' scarf. 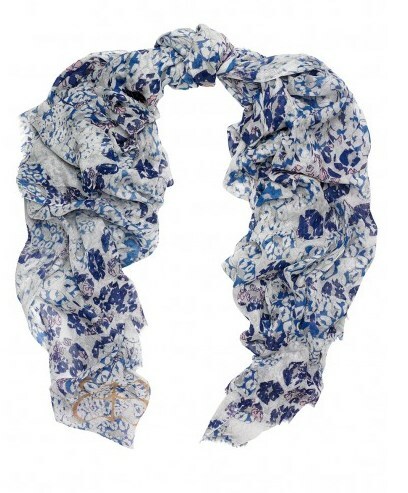 The blue lip print cashmere shawl is described as "a playful print that will liven up any wardrobe. Use to energise a classic tee or create a stylish clash". It retails for £195. The Duchess wore her hair in a ponytail and completed the look with pearl earrings. If you're just joining us check out yesterday's post for a look at Princess Charlotte's birth certificate, visitors and a 15% off Claudia Bradby discount code - HRHKATE. It's nice to finally see a photo of Anmer Hall completed. =) Glad the family can rest in peace and quiet. So ironic - We waited and waited for this baby, and it was over in a flash :) That's life. I really hope some family photos are released in the next few weeks, and I hope they have a wonderful summer. I have a some general questions if anyone knows. Will they have a protection officer living with them full time at Anmer Hall? Do they set up everyone who lives with them with their own quarters and kitchens? Do we know how much staff they have, i.e. a cook or full-time housekeeper etc.? I never knew if the household help lived elsewhere and just came in for the day or a few days a week etc. It is a big house. Finally whenever they show the pool I do not see a fence or cover for it. In the USA you have to have your pool secured to try and prevent accidental drownings, does anyone know what the rules are in the Great Britain. Thanks. Ali PS Hope they enjoy the next few weeks getting settled with the kids in the new home. Actually, not every place in the U.S. Has laws about pools. I'm sure it varies by state (and even by county, within the state). I would like to know those things also. seems to me that their home is close to highway and a public little church. would hope they have more than just the regular contingency of security. The Kate and kitchens thing came from the Kensington Palace redo. Then the redone kitchen at Anmer was torn out and a new one put in. I suspect there's a staff kitchen too. I am a regularly reader of your blog but this is my first comment. Thanks for the wonderful coverage of the baby princess' birth. I visited your blog very often within the last two weeks. You did a great job. I have to admit I too was a little disappointed. I loved the fact that last time she looked like a woman who'd given birth and was beautiful with it. Her look was more natural, and we were better able to relate to 'our Kate'. It was all about George and less about how she looked. This time around she was so polished and made-up and formal. I understand that she probably wanted to look her best because of the cameras but if she'd listened to the praise first time round she'd realise that she didn't have to worry. Kate’s appearance had been commented on as a surprise by commenters here in the previous blogs, the general media and even the Russian media saying she looked too good immediately after childbirth, and they claimed it was delivered by a surrogate. The first time, she seemed to complement Diana’s polka dot dress after giving birth to William. Some people complained then, she took it casually with the dress looking like pajama. Well, it was summer and fittingly light and looked comfortable. It was also her first birth experience. Even she told the awaiting media, “as any parent would know, it can be emotional”. The common reasoning among people is that she has a team of stylists at her fingertips. That is one of the factors, but the circumstances of her labor medically and her own condition of health makes a difference. There was a high likelihood her labor and care was already under way by the time she arrived at the hospital. If epidural, C-section, excessive IV fluid is not involved, it seems one can look their best if they try. The idea that she set some standard reminds me of how flat her stomach became about after three months of giving birth to George. I have observed women who give birth to girls become more accentuated with their femininity (May be it is an innate thing). I feel exactly the same way. It is in stark contrast to how "normal" she seems to be. Too overdone. More natural like last time would have been more endearing. Good lord. You would think she came out in five inch platform pumps and an evening gown. As I recall, Diana was much more formal leaving hospital with Harry (smart coat, big hair) than she was with William (maternity dress we'd seen before, top of her pop-sox showing). Let me stress I am NOT making a comparison between the two women (there's enough of that already!) but I wonder if a couple more years of royal life between births meant that both D and K were just more aware the second time around of how much their appearance would be scrutinised and picked over. I can well see how that pressure would make a woman determined to look as good as she possibly could (even though both ladies looked fine the first time around). She didn't look like a slob and you're unhappy? To be honest, every woman post child delivery does not necessarily have to look like Kate. Each woman’s circumstance, mood and life style can be different. In general many women are escorted by one or two family members heading home without a photo op for the history documentaries and photo calls. It is a transitional time between relief, adjustment and becoming conveniently dressed for breast feeding with a relaxed look. For some women, it could even be the time for onset of postpartum blues. The high heels may not be too common immediately after delivery. She looked comfortable, vivaciously beautiful and happy. Good for her and other mothers who can pull it. I think it's like anything else. You learn from what you perceive to be your mistakes. Either Kate didn't like the way she looked coming out after having George or she felt better this time and it showed. Who knows? I do think she had her wiglet thingy on, though. No criticism from me for that either. But I'm pretty sure it was there. I so agree with you Anon 17:14. I would like to be a fly on the wall in some of the meetings of these papers brainstorming for angles to cover the Cambridge's--no doubt they pick the most outrageous angle. Let me say this; those outfits will only print those outrageous stories to the extent that readers will read and discuss and contemplate them. My personal feeling about that is that readers need to be more discriminating-that's my feeling and one which I practice, others not so much. Her wiglet thingy? With all that hair, why would she need a wig? Dear anon 15, Ihave posted nearly the exact comment on another blog! I am completely 100% on your side. A ponytail, wedges or ballet flats would have been enough, also less make up. She was MUCH more natural after George. But as other commenters pointed out, this will be THE photo, that will be shown and printed and seen a million times also in the future and they seem to have put their priority on this. I know I personally would have wanted to look less like a perfect princess, than a simple woman after childbirth. But apperently Kate and William thought different. Just photo worthy historical ready simple pretty outfit. Add that sweet smile and voila. Job done. My guess is we might all dress up more if the eyes of the world were on us and that Kate may have been less than happy with her appearance after George's birth and opted for a little more polish this time. As pointed out, Diana did the same. The heels seemed a little much, especially as Kate was a bit tippy on them but she does love her heels so I'm not surprised. No other mum should feel bad about Kate's appearance since they don't have her sort of resources at their disposal. But it is understandable that Kate was thinking about how she will look in magazines and books and would try to look as best as she could. Cath, I think you nailed it. This thread’s commenters by now reflect the understanding there are at least two images of a woman post labor &delivery. In this case, both Diana and Kate in their own ways fit into the classic expectation after their FIRST new born. Second time around both women seem to upgrade into reflection of their times. Diana’s time, the 80s style leaned more into big and grand including her wedding dress, train, sometimes shoulder pads and her post-delivery outfit. Kate’s second time around may reflect the working mom during work days in the age of super woman millennia. Another reason it became a surprise could be the fact that Kate came out of the hospital about five-six hours after the public was notified, and ten hours the same day after labor and delivery. It seems you are the same commenter as anon from Leominster. Well then, hello Julia. The following had been response I wanted to send your way, but was too late by the time I tried. This blog was moving on fast this past week. I wanted to say thank you for pointing out that March is mother’s day month in England (I think two blogs from this one). In US, as you might know, it is May (actually today). Happy Mother’s Day to all who observe and/or find true meaning in it. As far as reading into images, sometimes it is fun and other times it has real purpose. For all the people who complained about Michael’s seriousness entering KP, Charlotte posted an up dated photo of him smiling as he exited the same. To be precise, Mothers Day in US is actually the second Sunday of May. I meant May 10 for this year. I am. I was always anon here but used Julia elsewhere and decided to combine the two. Happy Mother's Day to you, if that's appropriate and to everyone else here. I've enjoyed reading your comments very much. You have lots of interesting ideas and information. As far as I'm concerned, mother's day should be everyday. But in March used to be calle d"mothering Sunday" and was a festive break from Lent. I'm glad Charlotte published that photo. No one can tell anything from one photo and I'm sure Michael is thrilled to have a granddaughter. He is just a man after all. It is usually hard for men to multi-task. Smiling and driving at the same time might just be too much for him :-) I mean this in the nicest possible way. Anyway I am a woman, and I don't drive and smile simultaneously. I concentrate on the road. And I am the master of multi-tasking. How cute. Thanks for the giggle. Maybe Michael was thinking about some business details he had yet to take care of and hadn't switched to party mode yet. How many of us smile all the time while we drive? It is one photo and even if it were ten different photos from ten different times it would only signify that Michael wasn't smiling in those photos. I expect they’ll keep out of the media until the elections are over and then publish a couple of photos like they did with George. After that I don’t expect we’ll see Kate, and possibly George, until Trooping the Colour on June 13. And then the Christening at the beginning of July, before the senior royals go to Balmoral. The queen has quite a full calendar in June, what with Trooping, Garter, Magna Carta, Ascot, service for Waterloo, State Visit to Germany, etc. I wonder if we might see Kate for some of this at the end of June. what does it mean "orf to the country"? I've heard it stated that is a somewhat upper crust way of saying 'off', but I'm not sure if this is actually correct or not. Anyone know? I wish it were but it's really the Daily Fail being snide. Upper-class people, with so-called posh accents, are thought to pronounce "off" as "orf". It's not a typo (I don't think) - it's a play on a particularly 'posh' type of English accent, the sort of accent that people who have country houses might have. 'Orf' instead of 'off'. It's also a phrase used in Britain to describe the dissolving of Parliament before a General Election - like the one we're having tomorrow. Orf is an old country way of saying off. It's tongue in cheek, "off to the country" - "orf to the country" in an upper crust, posh way of speaking. Hi Paola, it's colloquial English, and it means off to the country. Oh, that's even more silly! I just took for granted that it was a typo! Paola, you may like this conversation, a lot of which is in Italian? Everyone else can scroll down to a discussion of 'orf' in English. Thank you Anon 17:40, so much information! I don't know if I understood correctly, but the posh pronounce seems to be very close to the cockney one... Am I wrong? The English part was the only one giving a True information. Thanks! been to so I can review the menu. fish. So much of it I have had to look up to see what the food was, like rocket, haggis, black pudding, bangers and mash, squeak and bubble, treacle. And lots more. It has been a lot of fun. tour that I will talk my family into making. Hopefully sooner than later. Thanks William and Kate for "leading"
us to some good ones. Love it Greybird, cockney haha hardly posh! Orf sounds more like the ol' New York mafia used to speak. Maybe this blog is really American, not British? I am so very happy for TRH but sad for us.....maternity leave is for months and months and probably they will stay in Norfolk for the full summer if not longer since William will be working near by. That said, they will have the piece and quiet the crave and will be able to be with their children within that quiet space. Charlotte, as always, thank you so much for all of your amazing and awesome coverage. I know just from habit I will be checking in to see if anything is 'up'. Good health to everyone, and an enjoyable spring/summer season. I don't think we will see Kate doing much until the first of 2016. She wants to take an extended lea ve to be with her children. I read that it is fine with the queen. Then they are suppose to have a royal tour sometime in 2016. I hope thye take their children with them. Thanks Charlotte for providing such great, and up to date coverage of Princess Charlotte's arrival. As usual you did a superlative job. Look forward to the family photo, and Trooping The Color in the coming weeks. Thanks again. Thank you so much for your coverage over the last 2 weeks, it was amazing!!! Do you expect we'll see Kate at the Order of the Garder as well as Trooping of the Colour? I can't wait for family photos! The morbidly curious part of me wishes that we could get a peek inside the Cambridge's newly renovated homes! I love Kate's fashion sense, and I bet I'd like her home decorating sense, too. It would be like an episode of HGTV: Royal Edition. I know that they want to keep their personal and family life private, though, and that's good of them. I think a balance could be struck--the Swedish royal family, for example, does a good job of regularly releasing photos of CP Victoria and her husband Daniel and daughter Estelle, often taken in their home. I feel like it would be a good a way of satisfying the media so that they're less intrusive trying to get those elusive shots of the kids. But maybe they think that would just feed the press more. Princess Estelle is very young and I sometimes wonder if it is good for her to be so much in the limelight. I don't know that she's necessarily in the limelight any more than any other young royal in line for the throne. We see her at a lot of group events with the rest of the family. I think it just seems like she's more in the limelight because they're just more open with allowing the media access to planned photographs, and if that helps keep the paparazzi away, I think it's a good thing. It is interesting since both William and Victoria were raised with cameras on them (and both married commoners.) Victoria is making quite an active reputation as a future queen - William is attractive but much less well-defined with regards to how he will see his royal role in the future. Estelle at the same age as George, seemed confident, adorable and even a little precocious. George seems sweet but a bit shy - even a little timid. Estelle's publicity may not be that much more but it is well controlled. George has been much less often seen at home and thus is more a target for paps. He has had less exposure to cameras in the last year and to use a canine term - is not as well socialised. I can't see how the attention would harm Estelle. Many children raised in the public eye have done extremely well down the road - I'm thinking of Jackie Kennedy's children and Chelsea Clinton among others. Regardless of what anyone's political views are, few would say these children haven't been successful and appear well-adjusted. I'm thinking it has more to do with parenting than anything else. William will do George no favours by being over-protective when it comes to the press. The press is an absolute necessity for the royal family and the better the relationship, the better the publicity. The greatest gift William could give George would be to teach him to be relaxed, confident and accepting of cameras and poised in public. The worst would be to make him fearful or hostile or unduly suspicious. Controlled publicity at regular intervals would seem the best way to accomplish this. George is a future king - for his parents to show him by both example and teaching what his future role is from a young age would be the best thing they could do for him. Many royal children have grown up to be well-adjusted and strong leaders with this type of guidence from their parents and I hope in a few years that will become William and Kate's main goal. I agree absolutely agree with your point of view on this issue Julia. William and Victoria are 5 years apart in terms of age, but Victoria is next in line; William is not. Technically true but at the queen's diamond jubilee it was William and Kate with Charles and the queen, not Anne, or the Kents or Gloucesters. William - and George - are the future. They aren't third tier. From a practical stand-point there is an unprecedented lack of working young royals out there today. When I was a small girl, Alexandra was the star of the family, even though there was almost no chance that she would ever be queen. Before that, attention was focused on Margaret and her "set". Then when I was a teenager, young people looked at Charles and Anne and later Andrew, even though again, he wasn't directly in line. It's hard to believe now but he was hugely popular. Then it was Diana. Some have suggested the young just assume the royals are working with no need for someone to relate to but the young people know feel a loose affection in the queen, but have almost no interest in Charles and Camilla (actually they are more indifferent than I am. They just don't care.) Their only interest is in William and Kate, and increasingly mainly in Harry who is seen as approachable and is very popular. I think in many ways it is unfortunate that Beatriice and Eugenie weren't encouraged to take on royal duties as they might have filled a gap but have instead have generated negative publicity rather than positive. They are no further from the throne than Alexandra was. I have always tried to avoid placing blame on this situation because frankly, I don't know where it should lie. It may well be that Charles fears that if William and Kate got too much publicity it would lead people to want them as next on the throne instead of him. But attempts to bring attention to his work have failed badly. There was very little publicity about his recent visit to the States. All that is happening is that people are losing interest in the royal family in general - except when there is an event like a royal baby. Many people no longer seem to understand the purpose of the royal family or what they really can accomplish. I think this is a shame but don't have any immediate answers. I just think it is worth to keep reminding people there is a future generation out there someday and a few more pictures wouldn't hurt. I totally agree with you Rebecca!! I wonder if the DoC ever checks out Charlotte's blog? If I were she, I would!! If I were a royal (or a celebrity, or anyone else who might be the subject of a blog) I'd stay far away from the blog world and social media! There's so much negativity and nitpicking out there (not necessarily on this blog, just in general), it would be entirely depressing feeling like you could never do anything right. Maybe a job for an assistant or someone with the press office in charge of keeping track of image/public opinion or something. If I were Kate, I would never read any of the stuff written about me regardless of the source. Don't think that is a healthful thing to do. Almost all people in public life face this issue - it is worse for politicians than it is for royals. It is the job of their publicists to monitor what is written - I recall seeing secretaries back in the Charles and Diana days doing just that on a royal tour. I can't think it would be healthy for a royal to follow it too closely themselves - whether the press be good or bad - but to be out of touch would not be good either. We all face criticism in our daily lives at school or work - using it to advantage is what counts. How far is Amner Hall from Kensington Palace? The Telegraph mentions 115 miles/185 km so 2 hours ish? Depends on traffic of course. According to Google Maps (Kensington Palace to Amner Hall, Norfolk, it pulls up Sandringham Estate) 116 miles or 187 km. Roughly 2.5 hours NNE of London near the coast. It took them about 2 and a half hours to drive there and when they arrived they went in through a back entrance as the media we outside the main entrance of the house. Security opened the front gates to distract the media/photographers etc. The police have issued a statement to all media outlets reminding them that the Sandringham Estate is private property and not to take photos with long lens cameras. I hope they get the peace and quiet they deserve to bond as a family of four. Thank you very much to all the folks in the UK for this information! It's so hard to tell on maps how far things are. On maps, Norfolk looks very, very far from London! Anne in Manchester: Thanks for the update. Good for the Cambridge's that they were able to get home safe and unmolested. They did publish that a new road was being cut as an entrance to the home if I am not mistaken and also the walls were being raise and trees planted for privacy. In addition, Prince William is fiercely protective of his family: he might be a papa bear but he morphs into a mama bear when it comes to the safety and protection of his family, at least in my opinion. glad. He also gives them planned opportunities more than I thought he would. If a crowd came at me with all their Iphones day in and day out plus media I wouldn't like that for one second. No wonder when a child asked William what super power he would like if he were a super hero he said he would want to be able to be invisible. Perhaps he should consider then whether he wants to be king for the main role of a king is to be visible. Anon 09:53. I agree with you. I think his kingship is secure. Remember, that superheros do not use their powers all the time, only when expedient or necessary. No question, there are times when a man in his main role as king must be highly visible. He is a public figure. However, it shows incredible self-awareness and sensitivity to recognize--as a child--that the ability to be invisible would be a welcome superpower to have. Fortunately, even without having a superpower he does have the power of position that allows him to limit the access of the press some of the time. In a negatively charged dynamic, William sets the boundaries for himself and his family--as he should. There's no reason at all for him to indulge the piranha element in the press. There's quite a difference between that and legitimate PR. I look forward to a family photo. :)) In the meantime, I hope they enjoy some quality family time at AH. Now that they are off to enjoy the summer at Anmer Hall, what will I look forward to each day, as I check your blog, Charlotte everyday !! maybe that does not say much about my life, but I so enjoy the information and photos!! IMO - I think Princess Charlotte looks like Queen Elisabeth across the eyes. The cup is made by Emma Bridgewater: she designed teapots to be sold to raise funds for one of the Duchess' patronages. The mug purchased which also is a preorder item, comes with free shipping which is a bonus-- shipping across the pond to the US is very expensive. In addition, it is also helpful that the outfit shipping the items to purchasers in the US is local, meaning they are located here. Thought I would share for those who like me would like to have a keepsake for sweet princess charlotte. Amner Hall is about two hours from London, England. It is so nice that they can relax and bond in the country. 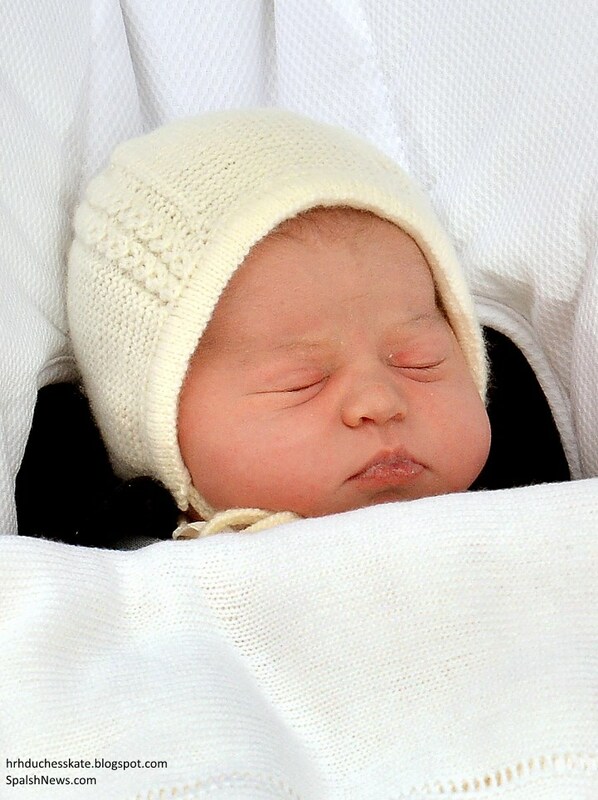 Princess Charlotte is such a beautiful baby. Great post as usual! I do wonder if Kate is actually wearing her white coat. Would it not be too hot/uncomfortable to wear a full on coat while travelling in a car for a couple of hours? I think its more likely she's wearing a knit-top/sweater. I agree that it's probably a cardigan or something of that effect. I agree, it looked more like a sweater in one of the photos, maybe even the textured sweater she was seen wearing on the Australia/New Zealand trip? I'd expect a sweater and jeans for the long drive to Norfolk would be a more practical choice. as much more suited for a two and a half drive with children. The coat is pretty and one of my favorites but I think that was probably left in her closet. It's just short of 120 miles. but the London part of the journey is difficult, whilst in the summer the M11 can be a nightmare. I just read that it's 120 miles, and takes about two and a half hours to drive there from London. It was funny to read that the gates to Anmer Hall were opened when William and Kate were due to arrive, with media waiting for photos, but William drove in a back entrance to avoid the press. Also read that 'letters' have been issued by Norfolk Police requesting privacy for the royals while in residence at Anmer (including long lenses, haha!) They deserve some down-time and will have their hands full with a newborn and a very lively looking toddler. i haven't commented at all this past week; but it was all very exciting and the coverage was excellent! And we know William said he wanted two (and he normally gets his way), The BRF is concerned about overpopulation etc etc. So William and Kate are essentially bowing out of the royal life (while still enjoying the perks) for an untold number of years, abandoning the public and, more importantly, the charities who have depended on their names, faces and, most importantly, the media coverage of the royal visits and event attendance, to raise funds and awareness. Those charities are now left to shout? I am sorry but if William finds the public life so abhorrent, he can't stand the media, he seems to dislike the British public almost as much as he hates the media, judging by his sour expressions whenever he's in public attending an event with the public present, and seems to have absolutely no desire to perform royal duties, to help out his father or his grandparents with their heavy schedules of royal duties. Why not just abdicate, for himself and his children? He doesn't want George or Charlotte in the public or to be seen by the eyes of the peasants. If he doesn't want to while his grandmother is alive, then certainly it should be the first thing he does as the Heir Apparent, once his father takes the throne. Anmer Hall is being repeatedly described as a "fortress," which is an odd way to describe a charming country house where you want to raise two little kids in a natural setting. We all get that they "crave privacy." But they also both need to grow up and understand that they won't have total privacy unless they retire to a totally private life or - unless they give the public a look inside once in a while. I'm rather surprised that their crack PR team doesn't understand the law of supply and demand - that if there is a steady supply of photos of the young royal family, the paps won't get top dollar for their own pics. Charles and Diana, for all their faults, seemed to understand this much better than Will and Kate do. Prince Charles has always had a well-publicized paranoia about being attacked or assassinated and it's appearing like he's passed his paranoia on to at least one of his sons. And Kate, of course, will go along with whatever Wills and the RF want. As much as I would like them to see out and about more, let them give the benefit of the doubt and hope that, they will both return to public duties soon and give us more. Until let them enjoy some family time which Kate does not enjoy asa William returns to work. She will be left alone with the kids no wonder she wants her family around. On the other hand I understand your concern about Will's privacy issues and his way of neglecting royal work. what all this privacy is "concealing" ?????? how about normal everyday life??????? without the cameras trying to get any picture of their normal daily life to sell. anything. walk a mile in the shoes. where, exactly, is Amner Hall being described as a fortress???????? It is open to a busy highway and a public access church. No stone walls, no moats, no buttresses. I don't know how they have coped with their public roles and the potential dangers that have been associated with that. talk about courage and resolve just to fulfill your schedules. A lot of people who are not even close to having that kind of vulnerability have home security systems, go cams, etc. on keeping on. you help ALOT of people in your daily schedules. Hello Anonymous, perhaps you'd like to get an exhibit together of all the public service everyone here does vs what William and Kate do. I think it might be quite enlightening. Elizabeth was making the point that if privacy is so important, if they crave a normal private life, there's a way to have it. And that is by bowing out. That's a lot more complicated than it sounds, as I believe the Commonwealth would have to agree, and there would be the issue of what would happen to George and Charlotte. If William were to find it so onerous, one would think he wouldn't want it for his children either. And, for what it's worth, Elizabeth didn't sound jealous to me. Just the reverse actually. I would be willing to bet that part of the Anmer remodel was state of the art security. It is on a private estate, but it does look exposed. I suspect it looks more exposed than it actually is, but I don't blame them for not wanting people looking in while they're eating breakfast. endeavors since they are a matter of public record. Proportionately given the number of bloggers and the Royal families hours available it isn't a stretch to say they most likely do outperform in that area. It isn't rocket science. The Queen seems satisfied with the amount of service everyone is supplying. William and Kate are on the third tier. They still do their part and he does work as a rescue pilot while Kate is a stay at home mom who does charity work. Not so lazy or unproductive in my opinion. who knows what kind of briefings or training they are receiving behind the scenes in preparation for reigning one day. Queen Elizabeth received loads of that kind of training. started a significant trust with his brother and wife and has handled the press with aplomb. All this and he's only 32. I wonder if any of us could do better. "bow" out, he would have done it by now so the queen could smooth things over. I see no indication in him whatsoever that he wants to bow out. That he wants some privacy is only human. So does the queen and she has figured out how to do it. So is William. kudos to William and Kate. thank God in heaven for that. I am so happy for them. Actually, Charles has been reported as being rathe paranoid, particularly after Diana died when many felt his fears about attempts on his life were overblown. Frankly, these days, any of us could be in danger and anytime but to live life fretting about that seems hardly worth it. Note the number of "ifs" in my post, Anonymous who mentioned bowing out. Other Anonymous, if you want to believe what you wrote, I am not here to rain on your parade. But that is the most optimistic rendering of William's altruism that I have ever read. I think he may also be a bit insulted that you refer to him as "third tier", though. Sounds a bit like a bargain basement. Now compare that with what people here have done, as you mentioned earlier. You said that he would compare favorably. You'll have to factor in the fact that most of us were not born royal, nor do we have the financial wherewithal or ability to open doors that William has, though. I'm still looking forward to reading it. I honestly can't believe the harsh accusations being made against W&K. A bit dramatic to say the least. Kate just had a baby, William will start the new job and they will not be in the spotlight for a while. There's nothing new here except a fresh round of W&K bashing. If this is how some folks get their kicks, then oh my. other people have put it this way. he could embrace a "Paris hilton type" lifestyle but he chose not to. bowing out was mentioned here today other than by yours truly. nothing I said about william wasn't simple and to the fact, not fanciful at all as far as I can discern. old philisophical "egocentric predicament" comes about again. Elizabeth gave some opinions, and all she's got is a bunch of people complaining about the fact that she posted them. Motivations for publishing an opinion are not germane to a discussion. What's germane is the opinion and it would really be great if we could talk about it for once. Why is William so concerned with his privacy? Why does he not seek some accommodation? Is he comfortable with his future role? Is he ambivalent? Does he wish he could be in Harrry's position instead of being in the responsible role? Does he resent it? Is he happy with it? those questions are highly subjective and not just a little redundant as such. His actions seems to indicate he is still with the program and okay with it. He's not inordinately concerned about privacy. Bluhare I commend you for trying to back up Elizabeth. Honestly I have just started ignoring 'anon' comments as I feel if they cannot back up their statement with a name then it is not a comment worth discussing. Plus I think the anons are the same person:). Also when a person cannot think of a good argument they bring up the jealous comment. Because Kate is beyond criticism and those who do must be jealous! It's really silly. Elizabeth brought up some good questions. But sadly some people can't handle it. Btw Royalfan, criticism is not bashing. So please stop acting like someone pointing out something negative about Kate is horrible and so offensive. Your the only one bring dramatic. So don't get your knickers in a twist. Honestly I hardly come here anymore because of people who only idolize Kate instead of just liking her and thus get rude when anyone questions Kate. There is nothing new here other than people thinking they need to personally defend Kate like she is their bff and thus being insulting/rude to varying opinions. It's quite nauseating! I beg to differ, bluhare. Motivation *is* germane when comments such as Elizabeth's are published on a FAN blog. Considering the tone and content, I'm not sure how one can argue that it was just an attempt to share opinions and talk about them. And I believe you are too intelligent to truly believe the defense you are offering on her behalf. Thank you, Anon 2:35, for simply listing William's achievements accurately. It's good to be grounded in facts! I wonder whether it would be best to simply ignore bombastic negative attacks. Walling such fulminations off with silence would probably deprive their authors of whatever pleasure they derive from them. It would be hard to discuss William's motives since we are not possessed of the facts about his thinking. Whatever we said could only be guesses. In psychology, that "ignoring" is called putting a behavior on an "extinction"
pattern. And it works. So apropos in these situations as truly William is the only one who can answer those questions. WHY go on and on and on and on about that? Truly, what is the motivation for that? I seriously doubt that William would be offended by being called "third tier". send it off and see what happens. Please show me where it states this blog is for fans only, royalfan. I commend your defense of my intellect, but I must confess I wonder why the rest of you only have one argument. You and I used to have plenty of conversations where we disagreed and they were civil. Not so much now. The rest of you (and I agree Kat; it's only a couple of people if that, who don't have enough courage to sign their names to their (sometimes) vituperative comments) make me laugh, you really do. The blog is rampant with speculation, and if we can only discuss what they've actually said, the comment section would be a yawning chasm. Fans speculate constantly about Kate, ad nauseum actually, comparing her to a saint in one instance. So, please PLEASE, put people you don't like on "extinction". I welcome it. That way those of us who would like to talk about it can do so without being interrupted incessantly with unnecessarily vicious comments. I would be careful about throwing the "J" word around for someone who expresses a contrary opinion. I know people who are republicans. I don't agree but I wouldn't term them jealous. They raise valid questions about the equality of people and the expense and purpose of the monarchy. Why someone is royal is being questioned. To say republicans are jealous because they don't agree with me, would be to say I'm jealous of Ed Miliband. I'm not, believe me, I'm not. The points Elizabeth makes are valid ones and you don't have to be a republican to be concerned about William and Kate's actions. They are a very popular couple simply because of youth and beauty and they are riding on that and the overall security of the monarchy. Not all think this is good or wise. The couple is more than entitled to time off to enjoy Charlotte but sometime soon I would like to see them act like the prince and princess that appear on Charlotte's birth certificate. Their work ethic has been called into question in many sources. For some of us to look at the long-term at a time where the very word "Great Britain" is in question - isn't jealousy - it's unease. We want a strong monarchy - there is nothing wrong with that. To assume that will happen automatically is one opinion - but we don't all agree with that view. Personally, I think the time to build a strong royal reputation is now, not later. As for the article on the Middletons, I think it is nonsense but I do think Kate needs to lessen her growing reputation as mummy's little girl. I was a mummy's girl until the day Mum died but I would never have let that show in my professional life. It's less a case of William and Kate not being close to the Middletons than showing some independence. There is a great void right now about the couple and the Middletons are filling it. There has I think been some articles about them backing off from reporters who are likely to have connections with the palace - so this isn't all fantasy. Yes. the queen approves. But she apparently accepted Charles' relationship with Camilla and didn't tell him to go mend his marriage. She has allowed Andrew freedom to ruin his reputation. She loves her granddaughters Beatrice and Eugenie - and yet has not curbed their holiday excesses which is destroying their reputations. The queen is a wonderful woman but anyone who thinks she always has the pulse of the nation should remember the film - The Queen. No, I'm not jealous. . I was thrilled with the birth of Charlotte and I want her to grow up with a secure monarchy - one that gives republicans less valid scope for criticism. Unmitigated admiration isn't always the wisest thing for anyone. Prince Charles has been much too flattered in my opinion especially by his wife. (I'm not jealous of Camilla either - I just think she is very bad royal news - although many disagree.) Can't we just accept we have differing concerns and opinions without seeking motives? Well said, Julia. Absolutely spot on. Oh Julia, bluhare so nicely put. I really enjoy reading u both. But I am afraid wthat u will get in return is: yes, it is a fan blog, you can disagree but the constant, harsh criticism, taking down are tiring. So I am starting to give up hope that we can discuss anything here without name calling. But if I am being "dramatic" in responding to the original post, perhaps you skimmed over it. Her choice of words speak for themselves. Julia your response was mature, non-offensive and nicely thought out and presented. Do wish the Queen had more say over her family. Thanks for your input. All of the people who sign Anon are definitely not the same, or even just two! We are quite a few who might use a moniker elsewhere but do not want to make ourselves victims in the cat fight here. I believe Kate's dress was said to be a cotton and wool blend. It seemed she could have used a coat with it. She was quoted by a lip reader as telling William she thought Charlotte was cold, and they should take her inside. Charlotte was pretty well wrapped up, but Kate was probably chilly. Anonymous 8:19 both a fun and worthwhile issue to raise. Here are my questions for William, not yet narrowed to five. 1. Sir, you are a cypher to me. You have expressed interest in the homeless, in the protection of wild animals and your foundation has a number of charities linked to it but there is little public familiarity with these charities and you have not been recently active in any of your causes. If and when you take on a full-time royal role - will these continue to be your main interests and how will you support your causes? 2. I've have noticed many recent immigrants are some of the most ardent republicans. Many come from countries where equality was an issue. Presumably these beliefs may be passed to their children. Without dealing with the issue of immigration which is beyond yours or my control, how do you plan to engage these people? 3. Your grandmother saw herself as taking a sacred vow and has indicated she will never abdicate, yet abdication has recently become more common in other monarchies. What is your view? Would you consider abdicating for George? Do you see your vows as sacred? 4. Your father created the Princes Trust, your grandfather an awards scheme. Yet young people are now less engaged with the monarchy. How do you plan to draw them in and do you have any plan for a scheme of your own? 5. The European monarchies are filled with active young royals but many royal events there have no British members from the royal family attending. Why is this - the family or the government, and how does it fit with England's place in the EU? 6. You and the duchess don't have a lot of practical royal experience. If you were to become king tomorrow, would you be prepared to take on the work load? How do you see your future role as king? 7. You're presently a helicopter pilot. Your wife is a housewife who dabbles in charity work. Why should I curtsy to you? I don't say I won't but I want to hear why you think I should. Why do you see yourself as entitled to that extra respect if you're not an active royal. 8. Do you mind be calling third tier. Do you have any idea what I'm talking about? Amen Julia! You were very thoughtful in your comment. But sadly I agree with blue27 and it is getting very tiring. Vowww Julia, I wish he had answered a few, it would be so interesting to hear his point of view. Sadly it is a wait and see game. Please be encouraged to share your point of view, dont let the yessayers put you off any topic. Thanks. The fabric does look heavier than silk. I can feel the need for detox or a support group right now. I am having Duchess Kate withdrawals. All summer!! Oh sigh. Thank goodness we have promised photographs to perk us up a bit. I know they deserve this rest and bonding time. Thank you Charlotte. Charlotte is anyone donating to Baby Cambridge#2 for East Anglia Children's Hospice (EACH) to help a child on behalf of Princess Charlotte? Have a great evening all. Did anyone hear that Princess Charlotte's bonnet had been on backwards? Now I want to see what it should have looked like. Erika, the blog From Berkshire to Buckingham has a picture of what it should have looked like. Thank you! I'll check it out. place is and the place for the po's. Also shows the pool and the tennis court and the 16 x 16 breakfast sunroom with the glass roof. Also shows the kitchen prior to Kate's renovation and also how close they are to the highway and the nearby church. probably a lot more because there are a lot of photos and articles. This following link is one of the better ones I have ever seen for views of where everything is located. Can anyone imagine the upkeep inside and outside. It sure is a beautiful estate. I am sure Kate and William with their little ones will enjoy this peaceful and very private setting for years to come. Charlotte. I have a brilliant Idea. Why don't you work with Claudia Bradby and start designing pieces for us with her to commemorate duchess Kate and her family. Gosh-I so like the idea that our blog family could work with Claudia Bradby to design pieces to commemorate Duchess Kate and family. BTW- we as a collective group selected the little babies name- correctly!! Would be so much fun!! I do not understand what was offending about my suggestion of a Kate loves post on beauty regime. I see you have accepted and posted a lot more topics I consider offending to other readers and to the Duchess. Furthermore, this was the first time I have commented here having read the blog since the birth of Prince George. I thought I could praise you and at the same time come with a wish for a future post. I will not continue to comment if my comments will not be recognized. It is a great idea for a future post! Jen, don't take it so personally. Okay, I know this is seriously off topic, but I am LOVING Letizia's new hairstyle. It looks very sharp and sophisticated. I agree, I really like it too. I'm rather hoping the Royal Digest will resume now that William and Kate are going through a quiet spell. I've missed it. You know, I really don't like the anti-Carole stance that the media has taken. But there is something that rings truer than usual from DM articles. What do the others think ? Anything authentic about this? I think these attacks on the Middleton's are disgusting. It's almost as if their story has been *too* much of a success story, with their daughter's marriage to a future king being the straw that broke the camel's back. If you consider all the problems we face in today's world (people being beheaded for religious beliefs, people struggling to make ends meet, bullying and shootings in schools, starvation, disease...OMG... I could go on...) it really does make it seem as though some folks are determined to find *something* wrong with this family. Things can't be this good for them...they can't be so happy. The Middleton's made their own way, they educated and raised their children to be good citizens, they have been involved with charities (and ALL of their children are in some manner), etc. For this they should be applauded and not torn apart with a vengeance that does appear to be personal at some level. And if you're wondering if I am pointing to the "j"word, the answer is yes. When it is sooo over the top, it's difficult to see it as anything else. Hi Anon 04:24, thanks for sharing the link to an interesting article. Who knows, but it sounds like much of it could be true. Clearly Carole has excellent organisational skills, but it's a little concerning to think that Kate relies on her so much. William obviously likes her company, no doubt to assist Kate, and perhaps genuinely likes the calm and order she creates around them. I can see why Michael Middleton would be uncomfortable though, and hope it doesn't bode ill for their marriage. 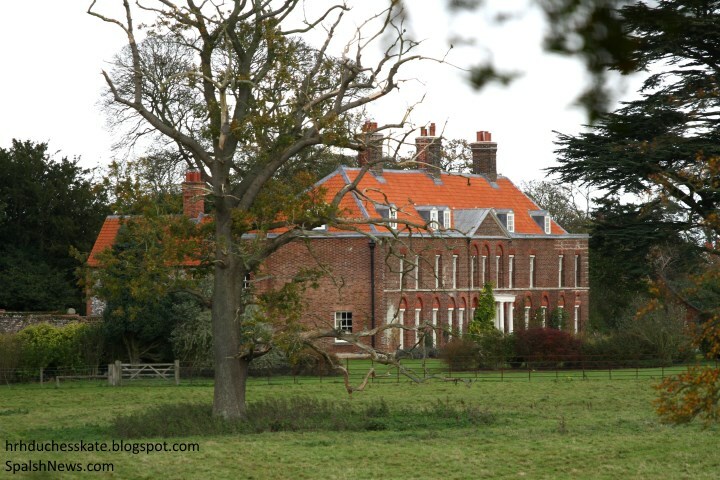 If he's happy in Berkshire, he certainly wouldn't want to relocate close to Anmer Hall. Perhaps as the article says, he doesn't have much say in the matter. In the long term, either Pippa or James marrying and having further grand-children might take Carole's mind off the Cambridge's lives? Some of the detail in the article is very interesting, in terms of how they live. No matter what we might think of Carole, I bet most of us would welcome someone as trusted as her as a close family member to keep things in order and entertain the children! Whether disgusting or not, this is being reported in the mainstream press, and Carole should take note as SHE will be the one to take any blame if anything goes wrong in the future. If it is truly creating tensions in Carole and Mike's marriage then it is a problem, no matter where you stand on Carole. If she is willing to throw a 30 odd year marriage away to run William and Kate's life, well . . . . not sure what to say about that other than I'm glad I don't have to deal with it. That being said, I don't care what they do in their private lives. I care when it intersects with the public, as in the privacy issue and how it's dealt with publicly. However, it doesn't give me a whole lot of confidence in their ability to deal with life and their future public roles if they can't even deal with their own house and staff. I am the original Anon who posted the link. I guess I was wondering whether people think it is true or not ? I don't doubt that the media is "j" of Carole.. I absolutely believe that. However, there were a few points in the article that are so fine in detail that I don't think that DM reporters would have the intellect to dream them up. There is a ring of truth to it. If Kate can only function at Anmer with her mother around that would be alarming. I am sort of inclined to believe it because I remember that picture of Carole, Kate, George and the RPO. Carole seemed to be saying something quite intensely to the RPO, while shielding Kate. There was a definite vibe of "You need to listen to me - I make the calls around here" from Carole, while from Kate it was "My mom has it, I am only going to listen" and the RPO was like "I don't want to take orders from this lady". There was a certain "gatekeeper" vibe to the whole picture. If it is indeed true that Carole is spending a month with them I would be very very concerned. It is crossing a line, a big one at that. way off base and negative, doesn't even bear logic. Enough to make me bid adios to this blog. yikes. "reported in the mainstream" is so reliable. all those extrapolations from that are even more hearsay and speculative than the mainstream reports. none of it even bears logic. It's interesting because there's been confirmed sightings of Carole Middleton in Bucklebury and the Berkshire area in the past couple of days. It certainly is hard to believe much of what the media are reporting. and the daily mail. that bordered on jaded journalism in my opinion. Since when have most bloggers here been fans of the daily mail anyway? are we bored or what? Anon 21:59, regarding your cauldron reference....thanks for the giggle. Where I live, it is traditional for a mother to go to her daughter's aid after childbirth. The DM's description is slightly ridiculous, but Carole would be considered neglectful if she were not available to help Kate for awhile after a new baby. Being detailed while lying is a good lier's tool, and the Daily Mail use it on a daily basis. Their articles are ALWAYS full of detail and apparently superclose sources, and always sound believable. Yes, hard to figure out and pure speculation on our part much of the time. I did wonder though that while William is on paternity leave, perhaps Carole would stay in Berkshire, and it would make more sense for her to be around to help Kate with two little ones when he returned to work? Time will tell, but she may go to Anmer when William returns to work in a few weeks' time. Carole is obviously not in Norfolk, that should give you guys something to think about. I do wonder how the daily mail came up with that thing about the children's clothes being wrapped in tissue paper though. That seems almost too strange to be made up. That is the type of thing Martha Stewart advocates as a "good thing" and any other number of articles over the last fifty years in Women and lifestyle type magazines. If you were the type to enjoy that sort of thing the pink and blue would be cute. I wouldn't put any credence in any of it. I know they did a huge article on Carole's 60 th birthday party going into detail after detail. That has generally all been debunked. And, facts can be presented as good or bad depending on the flavor/choice of the words around them. I think it is almost criminal how they seem hell bent for leather to try to malign the Middletons. a lot of other stories to cover that are actually stories. anyone can give details. Those details are not truly corroborated and thus just hearsay. exactly. embellishment. And, they have been doing that for years. 1. The betting surrounding Princess Charlotte's birth. Is it something of a national passtime? Is it primarily related to sport AND the Royal Family? What else does the British public enjoy betting on? What percentage participate? 2. The quintessential British diet. In some articles featuring William, Kate, and Harry sightings at restaurants, their meals are described. The food sounds foreign to an American palate, so I wondered if you would be interested in doing small features on their favorite dishes. It could be one way in which we could emulate Kate and feel a little bit more "British" (which I personally equate to 'refined' and 'polished'). 3. What in fact IS the proper way to serve tea? That is, if you or Kate or Carole Middleton were to do it, what steps would you follow? It always seems so natural and graceful when a UK woman pours tea and holds a tea cup. My UK friends tell me that what I drink is not, in fact, "tea" and laughingly refuse to explain. I think they enjoy the "Oh, you silly American..." bit. All in fun, of course. Does the nation still observe "tea time?" Is it a daily ritual for you, and do you think it would be at the Cambridge and Middleton homes? And what exactly is "high tea?" 4. Are there data to indicate the fiscal impact of Kate's involvement with her charities and patronages? I know there seem to be data about her impact on the fashion (consumer) world, so I would hope there would be information on her more serious pursuits as well. 5. (unrelated) Dearest Charlotte, I understand if you would prefer to reveal yourself only through your unique lens on the blog, but I think many of your readers would LOVE a post telling us about you yourself! We've so enjoyed your coverage over the years, and I have a feeling that this is merely one of your many worthwhile persuits! Okay, again, these are just a few ideas from a wish-I-were-British perspective! You will do an amazing job, and I look forward to every single post. All the best to you and the community! Fantastic suggestions Anon 05:03! Thank you and thanks to Charlotte if she will follow your advice! As an Italian woman I can but be happy of such a nice perspective of becoming more learned about "being British". Those are some fabulous suggestions!! I agree with you Mellie in regards to the press. But they named their daughter after Prince Charles and after other royals named Charlotte. Not after a person that they have never met who runs a blog. Not that there is anything wrong about running a blog. It is a good blog. But lets get it right. Any truth to what I've heard about William & Kate tricking the press waiting at Anmer Hall by opening the front gate for their arrival, but actually going in the back entrance and avoiding the press? "tricking" the press? maybe they just decided to use their side driveway. maybe it goes more directly to where they load and unload stuff from their car. It seems like it's true, otherwise we would have seen pictures of them arriving. Stuff like this annoys me. How can it hurt to just let the media take one more picture of them in a car. If the media consistently stalked their arrivals and departures I would get it, but it doesn't seem like that happens. A momentous occasion just happened, so how can it hurt to let the public get one last glimpse before the Cambridges retire to what is obviously going to be a very private summer for them. It's really not a huge deal either way - I just think stuff like this is so silly and doesn't help endear them to the press. Especially since the children would be protected by blacked out windows anyways. And especially since they were about to send out a letter asking for privacy. It seems like it's more likely they will be listened to if they let the press have these random moments. Do you never consider that cameras pressed against the windows of the car, would terrify children as young as these two. We saw both children last week---give them a bit of peace now. not lol to your comment Jean but Maggie's. they used their side driveway. call out the marines. I too liked Kate's look better the first time with George than this time with Charlotte. Just to be clear, this is not meant as criticism. She looked beautiful and I cannot imagine having to fave the press just hours after giving birth. But I do think she looked more natural after the first birth (vs looking almost overly coiffed this time), and while I like the design of this dress better, I liked the cut of the first one more. This one is so shapeless and I do find it sad that after she got so much credit and praise for "daring" to show her bump after the first birth, she went with a dress that hid it this time. But I don't blame her - I'm sure all the pictures after the first birth made her more aware of the media attention and made her want to look even nicer. I do wish one day a royal lady or celebrity would come out after giving birth in flats and no makeup - just naturally. It would be a lovely way to send a message of support to all of the mothers who can't afford a bespoke dress and a hairdresser at the hospital. It's obviously not Kate's fault that there is so much pressure for mothers to bounce back quickly nor is it her obligation to do anything about it, but I do wish she or someone else famous would do that once. But whatever, giving birth is already such a tremendous event, again, I can't imagine having to face the media so soon after. Kate did wonderfully and I hope they have some wonderful private time to themselves to bond with Charlotte and help George adjust. Any woman who needs a celebrity or a duchess to be ugly in order for her to feel better about herself is probably immature to begin with. Maggie I agree. I liked the look Kate put together after George more as well. It looked more natural and she still looked beautiful. This time she looked beautiful but way more done up-more like a doll. The dress hid her stomach but the blanket also hid it. She seemed more comfortable the first time around. I like her in a more low key look. I think it would encourage women that they don't always have to be done up to be beautiful. She looks great even when she is not dress up like a doll with a ton of makeup and a blowout. She is a such a pretty girl, she doesn't need it all. There's a big difference between ugly and natural. I just wish them all much love and happiness. The poor girl is under a microscope every time she steps out the front door. She could wear baggy sweats and a hair scrunchie and we'd still admire her all the more for it. No one is perfect. She's a wife & mom first and foremost. The rest is just icing. Though for her to sport a couple of tiaras now and again would be kind of fun too. It would surely help promote the princess fantasy. Since when has any blogger on this blog site ever started believing the Daily Mail? Oh yeh. They 'tricked" the press. They planned it the whole way there amongst wicked and gleeful peals of sinister laughter. Why didn't people go on and on about how thoughtful and caring it was when they sent pastries to the csmpers outside the hospital or sent a birthday cake AND card to Terry Hutt the EIGHTY year old camper outside the hospital.?????????????? Remember how William and Harry came out of Clarence House or wherever it was the night before George was born so they could say hi to the people outside awaiting the birth. Totally unplanned but kind and their po's had to scramble to make the necessary security adjustments? mere mention of those things.